In the story Native Americans fought on both sides of the Civil War , only the five Native American tribes were mentioned. 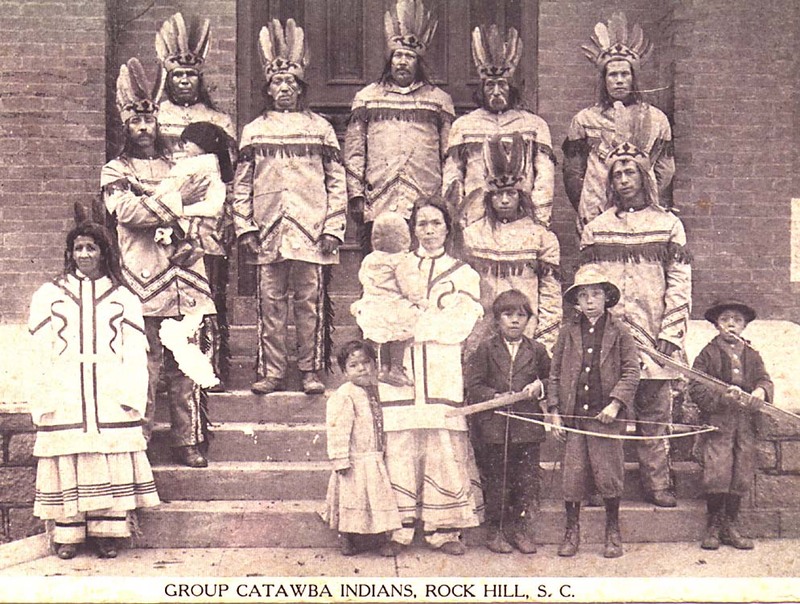 The Catawba Indians have often been left out of historical accounts. A reader graciously shared this information about the Catawbas and their participation in the Civil War. The The Catawba Nation is the only federally recognized tribe in the state of South Carolina. “The Catawba Indians, though a war-like nation, were ever friends of the white settlers. They aided and fought with the Americans in the Revolution, and the Confederates during the Civil War. Tradition says they immigrated to this portion of South Carolina from Canada about 1600, numbering some12,000. Their wars with the Cherokee, Shawnee and other nations, together with the smallpox, depleted their numbers greatly. In 1764 the province of South Carolina alloted them 15 miles square in York and Lancaster counties. About 1840 a new treaty was made, the State buying all their land, and afterwards laid them off 800 acres on the west bank of the Eswa Tavora (Catawba River), six miles south of Fort Mill, where the remnant, about 75, now live, receiving a small annuity From the State. This is on the East Base of the Monument. 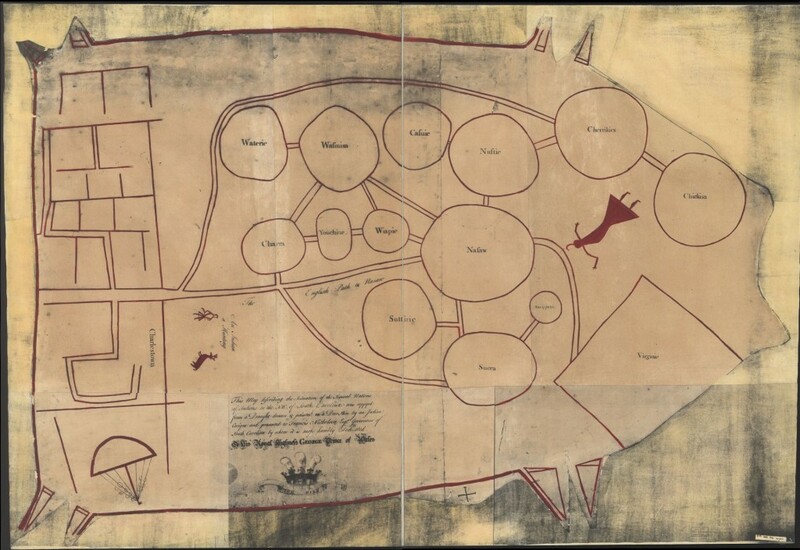 The Catawba Map below is from Wikipedia Map made by a Catawba chief in 1721 and given to South Carolina colonial Governor Francis Nicholson. The circles represent different tribes, and Charleston is to the left. American Indians – 20,000 of whom fought in the War Between the States – played their most Prominent role in the Civil war’s Eastern Theater during the Petersburg Campaign From July 1864 – March 1865, especially in the June 30 Battle of the Crater. Iroquois from western New York State, Pequot’s from southern New England, and Catawba of South Carolina fought in that battle. Most of them served in the Union Army of the Potomac’s “White” regiments, Although they were sometimes segregated into all Indian Companies within those units. A substantial minority fought in U.S. Colored Troops (U.S.C.T) units Alongside Black soldiers and a sparkling of other people of color. Others sided with Confederate defenders, Joining Integrated, even elite units. Catawba’s served in the 5th, 12th, and 17 South Carolina Infantry. They fought in some of the war’s bloodiest battles – Antietam, Gettysburg, and Petersburg – most of them serving in Capt. Cadwalder Jones’s Co. H of the 12th South Carolina. The Catawba of the 17th South Carolina went into the Petersburg trenches With Brigadier General Stephen Elliot, Jr’s Brigade in may 1864 and would remain there until Apr. 1865, helping to defend against six Union assaults on the city. One may discard previous attempts to compile an accurate Catawba Indian Confederate Roll and enumerate a more accurate list taken from surviving military records found in the national archives, though even this roll must be read with caution. Not all the Confederates records survived the chaos that followed the surrender at Appomattox. Other files are clearly incomplete. The roll gleaned from surviving archival records contains the names of eleven Catawba veterans. Catawba tradition adds an additional five individuals whose records apparently have been lost. These tell us much of the Catawba war experience. Jefferson Ayers – war the husband of Emily Cobb. At the time of his enlistment, he was the father of Jefferson (Buddy) Ayers and Alice Ayers. He was wounded at the battle of Boonsboro on Sept. 14, 1862 and was sent home to recover. He returned to service on Oct 3, 1862, and fought in the battles of Kingston (Dec. 14,1862), Goldsboro (Dec. 17, 1862), Sumter James Island (Nov 1863), and Petersburg (Summer 1864). He was wounded again on March 25, 1865, at the battle of Hatcher Run. He was captured on May 6, 1865, and war sent to point lookout, Maryland, where he died as a prisoner of war on July 2, 1865. William Cantey – Fought in the second battle of Manassas (August 30, 1862), and at Boonsboro (September 14, 1862) and Sharpsburg (September 17, 1862). 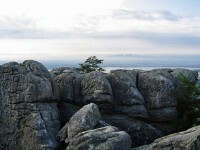 He took ill at camp in Culpepper and was hospitalized at Richmond. He returned to duty in November 1862 and fought in the battles of Kingston and Goldsboro (December 1862). He was discharged on February 3, 1863, at the end of his first enlistment. Alexander Tims (Timins? )– Was wounded at the second battle of Manassas (August 30, 1862). He returned to duty on January 1863 and fought at the trenches in front of Petersburg and in the battle of Petersburg (July and August 1863). He remained in the trenches at Petersburg until February 1865. In 1880 he attended his company’s reunion. Three years later he emigrated to Sanford, Colorado, where his descendants are members of the Colorado Catawba Band. John Harris – who had visited the Choctaw Nation in 1860 as part of the Catawba delegation, took part in the battle of Antietam on September 17, 1862. While engaged in the fight there he was shot through one of his legs and when it appeared that he might fall into the hands of the enemy he begged his comrades to kill him rather than permit this to happen. He was sent to a hospital in Frederick, Maryland, and took part in the exchanged of prisoners in 1863. In 1864 he was in the Invalid Corp. John Harris was chief to the Catawba from 1869 to 1871. Robert Crawford – was the husband of Margaret Jane Crawford and the father of Betsy Crawford. He was last seen on December 31, 1862, in the vicinity of Fredericksburg, Virginia, and was assumed killed in action. Robert Head – was reported as a patient at the Episcopal Church Hospital, Williamsburg, Virginia, on September 12, 1863, and later appeared on a register of soldiers who died of wounds and disease. The Head family later emigrated to Sanford, Colorado, where descendants still reside. the war to fight for the Confederacy. Robert Mush (Marsh?) – enlisted in Company K, Seventeenth South Carolina Infantry, on April 4, 1863, at Wilmington, North Carolina. On June 4, 1864, he was a patient at Episcopal Church Hospital, Williamsburg, Virginia, suffering from chronic diarrhea. He was sent home on a furlough and died there on August 28, 1864. William Cantey – also joined Company H at Orange Court House, Virginia. From May to August 1684, he fought at Wilderness, Spotsylvania, Jericho Ford, and Petersburg. His last record is dated July 7, 1864, According to Catawba tradition, he died in war. Nelson George – also joined Company H at Orange Court House, Virginia. From May to August 1684, he fought at Wilderness, Spotsylvania, Riddles Shops, Jericho Ford, and Petersburg. He was reported missing on August 25, 1864, and was probably taken prisoner of war at the battle of Reams Station. He was paroled as a prisoner of war on May 16, 1865, at Charlotte, North Carolina. Franklyn Cantey – was probably William Cantey’s brother. According to Catawba tradition, he was killed in the war. His name appears on an 1849 Catawba census for the Greenville District as aged twenty-three, so he would have been Thirty-Five at the outbreak of the War Between the States. John Brown – was the Husband of Margaret Brown and the father of John Brown and Sallie Gordon. According to Catawba tradition he died as a result of the war in 1867 shortly after his son John was born. Gilbert George (Billy?) – is held to be a Catawba Confederate veteran by Catawba tradition. He appears as an adult male in agents’ report as late as 1869. John Sanders – served in the Confederate army and died in the war, according to Catawba tradition. He may be linked to Lucinda Harris who had a son John Sanders. A John Sanders, who may have been married to a Nancy Sanders, appears in an 1859 agent’s report. William Sanders – also died in the war, according to Catawba tradition. William Sanders may have been too young to appear in the 1859 agent’s report along with John and Nancy Sanders, but most likely was a member of their family. According to Catawba Tradition and beliefs they worshiped a Deity known as “He-Who-Never-Dies”. They also believed that the soul of a person who had been killed demanded retribution in order to rest in peace. If a member of the tribe were killed, men would go out to avenge the death, and if successful, bring back a scalp as evidence of revenge. Catawba men wore loin cloths made of deerskin. During wartime, they painted a black circle around one eye and a white circle around the other. Catawba women wore Knee length Skirts of Deerskin. During winter and when traveling, men and women wore pants, leggings, and capes made of various animal hides. Men and women wore jewelry made of shells, beads, and copper… and on special occasions they painted their skin. Over 60,000 Englishmen and Canadians served the Union as well as a varied selection of Frenchmen, Scandinavians, Hungarians, and even a very few Orientals. The 79th Ny was made up of mostly Scotsmen who wore Kilts early on the war, until derisive laughter of fellow soldier every time they climbed over a fence drove them to adopt trousers. Ill-treated and ignored even by their own superiors, the Indian soldiers had only half a heart in the cause, and much the same could be said of the 6,000 or more who wore the Blue. All too often they were enlisted only to take advantage of old tribal hatred, pitting Union Indians against Confederate Indians and all too often they ignored Army Regulations and fought in the old ways. But they certainly lent color to the muster rolls of the North and South. Spring Fox, Big Mush Dirt Eater, Alex Scarce Water, John Bearmeat, and Jumper Duck, were all soldiers of the Union and these were simply Anglicization’s of Indian names Probably impossible to pronounce. Approximately 20,000 Native Americans served in the Union and Confederate armies during the Civil War, participating in such battles as Pea Ridge, Second Manassas, Antietam, Spotsylvania, Cold Harbor, and in Federal assaults on Petersburg. By fighting with the white man, Native Americans hoped to gain favor with the prevailing government by supporting the war effort. They also saw war service as a means to end discrimination and relocation from ancestral lands to western territories. Instead, the Civil War proved to be the Native American’s last effort to stop the tidal wave of American expansion. While the war raged and African Americans were proclaimed free, the U.S government continued its policies of pacification and removal of Native Americans. In the East, many tribes that had yet to suffer removal took sides in the Civil War. The Thomas Legion, an Eastern Band of Confederate Cherokee, led by Col. William Holland Thomas, fought in the mountains of Tennessee and North Carolina. Another 200 formed the Junaluska Zouaves. Nearly all Catawba adult males served in the south in the 5th 12th and 17th South Carolina Volunteer Infantry, Army of Northern Virginia. They distinguished themselves in the Peninsula Campaign, at Second Manassas, and Antietam, and in the trenches at Petersburg. As a consequece of the regiments’ high rate of dead and wounded, the continued existence of the Catawba people was jeopardized. In Virginia and North Carolina, the Pamunkey and Lumbee chose to serve the Union. The Pamunkey served as civilian and naval pilots for Union warships and transports, while the Lumbee acted as guerillas. Members of the Iroquois Nation joined Co. K, 5th Pa Volunteer Infantry while the Powhatan served as land guides, river pilots, and spies for the Army of the Potomac. During the Civil War there was no distinctions made when a Native American joined the U.S Colored Troops. Well into the Twentieth century, the word “colored” included not only African Americans, but Native Americans as well. Individual accounts reveal that many Pequot from New England served in the 31st U.S. Colored Infantry of the Army of the Potomac, as well as other U.S.C.T. regiments. At least 15 regiments and battalions were enlisted from the Cherokee, Choctaw, Osage, Creek, Chickasaw, and Seminoles of the South.” Many “often enlisted for private reasons of their own which had nothing to do with the Confederate cause”. There were a significant number of them enlisted in the service. It is estimated that as many as 12,000 Indians served the Confederacy, of whom most were members of the Five Civilized Tribes living out in the Indian Territory (now present-day Oklahoma). Also, they came from many more tribes scattered throughout the Confederacy, serving in North Carolina and also in segregated units with whites in North and South Carolina, Tennessee and Kentucky. Why did Native-Americans enlist to fight for the Confederacy? 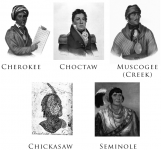 In the Indian Territory, the Five Civilized Tribes of the Southeast (their origin before removal in the 1830s by the U.S. government)-the Choctaw, Chickasaw, Creek, Seminole, and Cherokee-were in a dilemma at the outbreak of the Civil War. They were torn between the North and South. Neutrality was difficult to keep, and sides were to be taken. “They were dependent peoples as a result of American wars of conquest, treaties, or economic, political, social, and religious changes introduced by the ‘Long Knives'”. The Choctaw and Chickasaw sided with the Confederate government. There surely was distrust between these two tribes and Washington, and that was probably a good enough speculation for them joining the South. The three remaining tribes had more complex reasons. The Seminole, Creek, and Cherokee all had similar reasons for choosing sides. 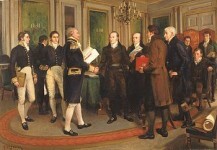 All three had splits that consisted of two parties, which were treaty and non-treaty factions. The reference to treaties refers to the ones signed (or refused to be signed) by the various tribes with the U.S. government for removal to what was to become the Indian Territory. The Creek division seemed to date back even farther because “the split among the Creeks was an ancient one. At the time of removal from Georgia, it almost flared into open warfare”. The Southern side in every divided tribe was always the treaty faction. The largest (and considered the most significant) of the Five Tribes was the Cherokee. Stand Watie led the Southern (and slave-holding faction) of the Cherokee. John Ross led the Northern faction that consisted of mostly abolitionists (ironically, Ross was a major owner with about 100 slaves), and he was also the Principal Chief of the Cherokee Nation. Most of Watie’s relatives were assassinated by Ross’s followers after the relocation treaty, and Stand Watie himself survived numerous attempts on his life. He was the last remaining member of the four Cherokees who signed the treaty. To survive “he organized his own military force at Beattie’s Prairie and Old Fort Wayne in Indian Territory which protected him and his followers”. Many of these men followed Watie into the Confederate service. What is not well known (besides the fact that the Cherokee were slave owners), was that both parties signed the Treaty for Allegiance with the Confederacy, but only one had the intention of honoring it. How appropriate that the Union fraction emulated what the Washington government had been doing for years to them, and that was to sign a treaty with no intention of following its terms! Watie’s followers viewed Ross’s faction in the same way they viewed the U.S. government, which was through dislike and suspicion and this incident increased those feelings. The Confederacy did a better job than the Union in honoring its promises to the Native-Americans. “As a symbol of the Confederate commitment to the Indians, the treaty also provided that the Cherokee were to be allowed a delegate in the Confederate Congress at Richmond”. The Eastern Band of the Cherokee were located at Quallatown, North Carolina. They had remained by co-operating with the state and national governments. Their main reason for enlisting was to follow a white man who was adopted by the Cherokee at a young age and had worked constantly with the North Carolina state government to give concessions to let the Cherokees stay in Quallatown indefinitely. The man was William Holland Thomas, and to the Cherokee he was Wil-Usdi. The Cherokees’ belief in him was indeed strong, but there were other than sentimental reasons for this attachment. They had “an anomalous legal and political status, claiming to be Citizen Indians, yet not have their person or lands protected under state and federal laws.” Also, “their desperate economic condition and their inability to purchase land for themselves because of racial restrictions made them overtly dependent on Wil-Usdi, their patron saint and benefactor”. The Eastern Band of Cherokees main motivation for enlisting to fight for the Confederacy and North Carolina, being to stay in Quallatown, was actually honored by the state. “On February 19, 1866, the North Carolina General Assembly granted a specific affirmation of the Cherokees’ right to residency in the state”.Sadly, Thomas’ luck declined rapidly after the war, and he died at the age of 88, on May 10, 1893, in an insane asylum. The Catawba Indians of South Carolina loyally served the Confederacy. They were a small tribe of only 55 people at the outbreak of war and only 19 of them were fit for service. One reason for their enlisting was that “to prove oneself in war was the highest manly virtue and a requirement for political leadership”. It could be stated, “for the Catawba, as well for many white southerners, combat was a proving ground for manliness.” The Confederate $50 enlistment bounty was another significant motivation. Being relied upon by the planters to be slave catchers also had something to do with enlisting. As can been seen, the Native- Americans enlisted for many reasons, from the distrust of the Federal government, to distrust between themselves. They were dependent on whites for survival, but would fight for and against them to assert the time honored right of any proud people, that being pride in who they are. Individual Indians may have had many differing motivations for enlisting in the Civil War, but they all shared that sense of pride. If Native-Americans would enlist to fight for the South, what about African -Americans, an idea which is difficult for the twentieth century public, which was raised on the over- simplified reason that slavery alone was the main reason the War Between the States was fought, to comprehend. It is indeed a controversial subject to deal with. What prompted African- Americans to enlist to fight for the South? “It is often forgotten that while slavery was the major underlying cause of the Civil War, its abolition was not the original objective of the U.S. Government”. The slaves had nothing to gain from a Union victory at that time for their status would have remained the same. The North was a racist as the South in many respects, due to the fact that many Northerners had never seen an African-American. Faced with these “hostile invaders”, many free blacks “volunteered to defend their homes against the new threat from the North.” Sadly, “no accurate record has been kept of black units that served the South, since most of them were state militia and never mustered into the Confederate Army”. Many free blacks and slaves were accepted into the Confederate Army as laborers, teamsters, and cooks. The Catawba who fought in the Civil War were Robert Henry Head, died of his wounds in VA, Robert Marsh-Mursh, died of injuries later, William Whitesides/Canty also fought, Alexander Tims was in the Lacy Guards. I have the genealogy and photos of some. The war of 1812 too. Even the ones who made it home after the war were ill treated by the whites and were not acknowledged for what they had done for many years. Boss Hanna, I understand that the Whites mistreated, not just the Catawba but all of the Native Americans. It wasn’t my intention to show that they weren’t, it was to show that they were involved in the civil war and not forgotten as a tribe. Glad they fought on the right side! Thank You Montez for sharing. 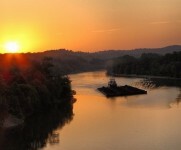 Fascinating history of the Catawbas! Few people realize the last Confederate general to surrender was Stand Watie, a Cherokee. I wonder if the Marsh is a relative. I love this fb page…always interesting:)! My father resembles these men and so do my uncles. And there are more than listed in the article…. The foregoing men descend from Col. Ayers aka Hixa-Uraw who was chief at the Treaty of Augusta 1763, and Capt. Ayers, both of whom were war chiefs of the Catawba during the French Indian War. The Pee Dee Band is proud to announce its legal incorporation in the state of Georgia February 16, 2016. This is a great moment in our history, because we as American Pee Dee Indians, are the first North American Tribe, indigenous to the state of “Carolina”, to be allowed to organize and hold legal birth records, as American Indians. The significance of this is that some of our bloodlines can be traced back to slavery, putting an end to the plantation slave system of race determination by Jim Crow methods. The last remnants of slavery have been officially dismantled, when the state of North Carolina issued birth records for the Pee Dee Band bloodlines, using scientific measurement, two parent heritage (dating back to before 1820), and issuing state identification, rather than using Jim Crow methods of race determination. Pee Dee Indians have legally organized in the state of South Carolina, who also have some common distant relatives to the Pee Dee Band, LLC. These Indians are officially recognized by the state of SC. The North Carolina Pee Dee Band’s heritage dates back to the civilization of river Indians in the state of Carolina. This era is before the great migration of the Cherokee Nation on the “Trail of Tears”, to their new homeland, in the western section of North Carolina. It is believed by the Pee Dee Band, that that trail included some areas of camp sites along the Pee Dee River in Anson County, based on some of the Cherokee facial characteristics markings of our people. How we differ from the Cherokees is that, 1) some of our people merged with descendents of slaves and slave owners, 3) some merged with Cherokee transients, 4) some of our people merged with members of other North Carolina river Indians, 4) we have a portion of our population who carry and have recessive trait eye color (blue, green, and hazel); North Carolina includes recessive trait eye color of Indians, in their state’s history. The state has run a play on the very issue, for the last 100 years. We are proud to have legally banded and it is our intent to procure our legal rights as an indigenous people, refusing to pass along our rights to be known as American Indians, and refusing to pass those rights and civil liberties to foreign immigrants, who will benefit from our heritage. We fought on the side of the colonists. At that point we already been on our tribal lands for over 4000 years. My Tribe was decimated with the smallpox 1732 – 1739. We went from 1600 families to 60. I have a scanned copy of the original letter from George Washington to My Tribe in 1776. Asking them to side with the colonists and that they would honor our land and are land treaties…… we fought as Scouts/ Catawba Rovers for the Americans. in 1756 my grandfather negotiated 15 Acres in Salisbury North Carolina through Thomas Dobbs for the King of England. King George granted My Tribe 15 Acres in present-day Rock Hill South Carolina. All my grandfathers were Catawba Indians. Just wanted to remind you that the United States is a “war-like” nation, and is not friends with a lot of people. Did you forget to burn your flag of the Confederacy? Sorry but this photo reminds me of those cigar store indians statues I used to see in western movies.